Asthma. You've heard of asthma. You know someone who has asthma. But do you really understand how serious asthma is? I'm going to cover asthma symptoms treatment and prevention in this article. Did you know that 300 million people worldwide have asthma, and 25 million Americans have asthma? Did you know that 4000 Americans die from asthma each year, and African-Americans are three times as likely to die? If you have asthma, is your asthma well controlled? Is your child's asthma well controlled? Or are you at risk? Asthma is chronic lung disease caused by the tightening and inflammation of airways. When patients have symptoms of asthma, they usually come and go periodically. But when those symptoms are active, it is called an asthma exacerbation, or an asthma attack. Symptoms include coughing, wheezing, shortness of breath, difficulty breathing, and chest tightness. When asthma is not managed properly, it can lead to a very poor quality of life, and even death. I'm going to give a general overview of asthma, including the symptoms, the triggers, the treatment, and when to call 911. When we breathe, our air comes in through our trachea or windpipe, that trachea then divides into a right bronchus and a left bronchus. These bronchi then further divide into multiple bronchi and bronchioles, which end up in air sacs called alveoli. These bronchi and bronchioles are our air tubes. When a patient has asthma, instead of the air moving through a nice wide open airway, the airways are tightened. Those smooth muscles constrict, and there's also an increased mucus production in the airways. So what does that mean? That means that patients who are having asthma exacerbations are trying to breathe air in and out of tiny, narrow tubes, which is very difficult to do. When air tries to force its way out of that narrow tube, it often makes a whistling sound or a wheeze. Symptoms include wheezing, coughing, chest tightness, and chest pain. And with the coughing, particularly in children, sometimes they'll have a cough even if they don't have a wheeze. So if you notice your child has to stop to cough when they have exertion, or they're running and playing, that coughing could be a sign of asthma. Other more severe symptoms occur when patients are really having a tough time breathing. If you look at a person with asthma, and they start to have a flaring of the nostrils. Or if you see them using their accessory muscles. Meaning, they're using their neck, their collarbones are going up and down, up and down while they try to breathe. Their abdomens or bellies can be moving in and out while their chest expands, this is a sign of respiratory distress, and this is the time that you need to contact your physician immediately, or even call 911. It is very important to be aware of the symptoms of asthma. What Are The Triggers of Asthma? 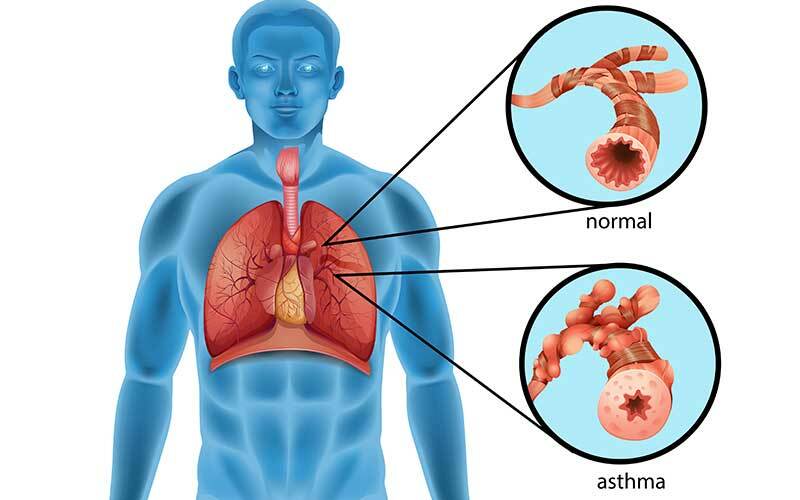 What causes asthma symptoms? Well, definitely cigarette smoke, pollen, pollution (both indoor and outdoor), dust, pet dander, and fragrances can trigger asthma attacks. If you look at my YouTube video on seasonal allergies, you'll see where I talk about allergens. Things in this beautiful outside nature. They can trigger asthma as well. Guess what else is a trigger for asthma? Stress. Cold air can also trigger asthma. That cold air, once it's breathed in, can cause the smooth muscles and the air tubes to tighten or narrow. There's also exercise-induced asthma. Now, this does not mean that you cannot exercise, it just means that if you have exercise-induced asthma, you have to take certain precautions. In order to be diagnosed with asthma, you must consult your physician. So if you or your child is having some of these symptoms, such as coughing, wheezing, shortness of breath. If some of those triggers are causing you to have symptoms, then you may have asthma. Nighttime coughing, or nighttime symptoms, can also indicate asthma. It's important to see your physician, where you get a complete history and physical, and certain tests, like chest x-rays or spirometry. While there is no cure for asthma, we do have management and treatments for asthma. If you are having an acute asthma attack, you should use a short-acting bronchial dilator, meaning it makes those airways wider and easier for you to breathe. Albuterol, for example, is a beta-agonist, so you should use your Albuterol inhaler or Albuterol nebulizer. In addition, your doctor may prescribe corticosteroids to help in an acute asthma exacerbation. Now, for long-term chronic asthma treatment there are long-acting beta-agonists, corticosteroids as well, there are anticholinergics, there are leukotriene inhibitors. Again, it's important that you consult your physician, so that you can be properly managed. Now many of you are probably reading this, and you're thinking, "Oh yeah, I have asthma and I just use my Albuterol inhaler whenever I need it." But is that Albuterol inhaler enough? If you are requiring your Albuterol inhaler more than twice a week, your asthma is not under control, and you need to see your physician for management. If your child is requiring Albuterol more than twice a week, or if they're having frequent nighttime symptoms, nighttime coughing, then your child is not well controlled either. Remember, 4000 Americans die from asthma each year. 11 Americans die every single day from asthma. Make sure you're not at risk. Most of those deaths are preventable with proper medications and treatment. How do you know when it's time to call 911 for asthma? Well if you are having an asthma attack, or your child is having an asthma attack, and you've used the Albuterol inhaler, you've used the Albuterol nebulizers, but you're still having those symptoms. The wheezing, the coughing, and the shortness of breath. And you're showing signs of respiratory distress, especially if you're struggling to breathe, or your child is struggling to breathe. With the abdomen going in and out and the neck muscles being used and or the nostrils flaring. Especially if there are signs of cyanosis, meaning there's a blue or dark tinge around the lips, then it is definitely time to contact your physician immediately and to activate the emergency medical system. Call 911. People die from asthma. Don't be a statistic. This ends my general overview of asthma including asthma symptoms, treatment, and prevention. Please comment if you'd like for me to go into more detail. Asthma is a huge topic, so I just gave you some brief pointers. And remember, like I said, stress can also be a trigger for asthma. Be sure to watch my stress video. And if you're someone who's stressed out because you're running around saying yes to everyone, click here to get your permission to say no T-shirt. "My doctor told me to tell you no." Remember to take care of you. Prioritize yourself. And as always, live your healthiest, happiest life.